Gerald Endl’s 8th grade graduation class from Saint Joseph Catholic School. 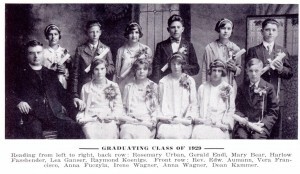 Endl is in the back row, second from the left. On July 11, 1944, Gerald L. Endl made the ultimate sacrifice while in service to his country. “For conspicuous gallantry and intrepidity at the risk of his life above and beyond the call of duty,” Endl was awarded the Medal of Honor, America’s highest military honor. Today, 70 years later, we recognize Staff Sergeant Endl and his sacrifice. 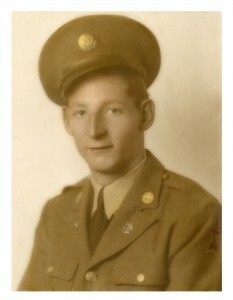 Born and raised in Fort Atkinson, Wisconsin, Endl moved to Janesville before joining the Army in 1941. He was first sent to Camp Livingston in Louisiana for basic training before being deployed to the Pacific Theater with the 32nd Infantry Division in 1942. 4th and 5th grade students from Saint Joseph Catholic School. 70 years later, Gerald Endl’s story has been brought to a new generation. 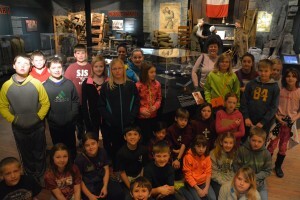 On April 15, 2014, a group of 4th and 5th grade students from Fort Atkinson’s Saint Joseph Catholic School, the same school Endl attended, visited the Wisconsin Veterans Museum and viewed Endl’s Medal of Honor on exhibit. Endl’s widow, Anna Marie, preserved many of her husband’s photographs and documents relating to his service and his death. These papers, now in the Wisconsin Veterans Museum Archives, tell the story of Staff Sergeant Endl’s courage and sacrifice above and beyond the call of duty.